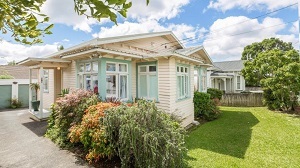 This three bedroom bungalow in Mt Albert sold for $1.06 million. Bayleys sold 14 of the 22 Auckland homes they marketed for auction last week, giving a sales clearance rate of 64%. A retail premises in the Wairau Valley on the North Shore, which was leased to an Indian takeaway operator, was also sold at the same auction for $454,000. That left nine residential properties unsold of which one had its auction postponed and the other was withdrawn from sale. At Bayleys' Hamilton auction, a house on an 8ha lifestyle block at Matamata sold for $850,000 (plus GST if any), two houses in Ngaruwahia were both passed in, and a couple of rural properties were also passed in. Another house in Matamata that was auctioned separately sold for $562,000. Highlights of the Auckland auctions included a modern Takapuna house that was four back from the beach and went for $4.56 million, a three bedroom 1930s bungalow in Mt Albert that sold for $1.06 million, and a house on a 2004 square metre development site at Massey that fetched $1.45 million. The full results of Bayleys' auctions, with photos and prices of all properties that sold and details of those that didn't sell, are available on our Auction Results page. Bayleys sold 14 of the 22 Auckland homes = Really low sales volumes and results. Now lets hear from the RE's, just how wonderful the market is and how you're guaranteed to double your property investment in just a few years. Yep I'll grab some popcorn and read the continuation of the "optimists vs the doomsday preppers"
Yeah and I'm just pointing out that the Auckland market it rather soft some would say limp. Plus the number of listings still remains quite high so not making much of a dent. I cannot imagine, just why an RE would sell these properties, it would pay him/her/it to buy them all, as it would be better to invest than sell. and would save him 4% ...immediately...and hold em till the cows come home. Just keep renewing the cheap scape Mortgage....na sweat. Banks would love them to death. Or am I missing something obvious. ? >" a three bedroom 1930s bungalow in Mt Albert that sold for $1.06 million"
So...a basic three bedroom house in a typical suburb...now 12-13 times the average salary in Auckland. National remains completely asleep at the wheel. Now you understand why their is no crisis as per national. I think the Mt Albert house may have been a very good buy for someone. It is a half section but has its own driveway. It has standalone garages and sold for only 32% above CV. This sort of place is very much in demand for professional young couples - well that's what I noticed when going to the auctions. I think it is a bit meaningless to say "this house is 12-13 times etc" because it is in the central part of NZ's premier city, a classic Kiwi property, the equivalent of which sells for an absolute fortune in Sydney. This house could well double in value over very few years. Average houses for average wages is now more of a provincial thing for a World City like Auckland. Am I right? We aren’t a world city Zach. We are a very nice place to live at the bottom of the world, the best part of 4 hours to the nearest big city and basically 12 hours at least to where all the real action is. We are however a great place for people to launder money, and a fantastic place for people from poorer nations to come for a better life (think India, Philippines, China to name a few). It's just the reality of the situation. Blame cheap air travel, migrant flows and the developing middle classes in non Western countries. For cultural reasons and safety, security and quality of life I would put Auckland in the top twenty. Things could change in the future but right now this is the way it is. I understand where you are coming from but people are voting with their wallets and their feet. It comes down to whether the government should represent citizens of their country (and future generations), or just sell the country off to the highest bidders. You talk like young and upcoming generations of Kiwis have no greater claim on their city and country than anyone around the world who wants to take it over. This seems to be the presiding perspective of those lucky enough to be born at the right time, and this current National government. If it's so, I'm sure young Kiwis would just like National to drop the pretense of "don't want to see Kiwis become renters in their own land" and admit that they're happy for the houses and land to be sold off out from under young and upcoming generations of Kiwis. They're happy for NZ to belong to other foreign holders, rather than natives. Otherwise, parties need to grow some cojones and actually start to make policy and law that is for the benefit of more locals than just the few who were born at the right time to benefit from the home ownership efforts of previous generations but feel no obligation to pass anything similar on to next generations. NZ once before faced a similar situation, and laws were passed that ultimately led to the high rate of home ownership achieved by the 1980s. It's since then that voters and governments seem to have abdicated any responsibility to anything except their own personal investment portfolio. As Gareth Morgan put it - only a certain type of person will do anything for money. The unfortunate imbalance is that the older generation voting in this way also expects a pension regardless of need, and they expect the same young people they're choosing to shaft to pay their pension for them. I think people are getting triggered by the term World City because they interpret it as 'World Class'. All it means really is primary transit hub into an economic centre. Also I think future generations will want this portal into the global economy rather then be isolated. Auckland is not the whole of New Zealand. You do have to think global now which means move to another country if it is better or even just for a change. That hasn't really addressed the points raised. The NZ government can and should be managing outcomes for the benefit of both current and future generations of NZers, and they're plainly not doing that - as you seem to note. I personally think future NZers will want a place to call home. I can move if I wish - my job allows me to, such is the demand globally. But I'm not solely concerned with outcomes for myself; I think it matters what outcomes we create for other NZers. I find it odd that whenever the work that previous generations and governments put into fostering home ownership in NZ is raised, people quickly jump to equating it with "government providing a house". May I suggest reading http://bwb.co.nz/books/home-truths to start with. As it turns out, you didn't do it all yourself without standing on the shoulders of those who came before you. Then, note that people are NOT asking for houses, they're asking for effective policy; policy that stops privileging and incentivising houses as an investment (rather than for homes), and instead prioritises the housing outcomes for local Kiwis vs. international investors (e.g. as Vancouver authorities have finally begun to do, after similar periods of intransigence and prioritisation of foreign investors). I would like to be able to buy a house at a fair price - by fair price I mean in the same the way I can buy a loaf of bread from the super market or a bottle of water from the shop at what we deem to be a fair price. But instead, trying to buy a house in Auckland has become akin to buying precious metal - it's been moved from a market of necessity for society to function properly, to instead something that people all over the world speculate upon. How and why we've allowed this, well I think I know and it's morally flawed but the ears of those who are guilty, appear deaf - must be coincidence that this correlates with age. In terms of a society to be able to function well and prosper - this isn't tracking in the right direction. It's short term gain for some, long term misery for many to come. Think and Vote - Though damage has been done but still better late than never. "I'm personally not a big fan ... because we're really expensive to visit," she said. Our tourist numbers would suggest otherwise. On the other hand, the freedom camper plague would tend to back up her sentiments. You realise that map you are linking to even says Auckland is a BETA city and you are comparing them to Alpha+ or higher. Which exactly what Leverageup is saying. I wouldn't get hung up on the word Beta. Obviously Auckland is not an Alpha city economically. I would argue, though, that it is an Alpha culturally, from the perspective of a non Westerner and even many Westerners. You got another link for that? It's obvious really. Auckland is a transit city among transit cities. It is a gateway to Australia, Canada, America and Europe for many Asians with a long term view for their children. School them in New Zealand and then send them out into the world's best universities - that's their dream. You can't see it because you're not looking for it. My feet are going to Australia because Auckland and its surrounding areas are to expensive to live. Sunshine coast. My family has lived in NZ for generations, and I make OK money, but Im not wasting it on unaffordable living, I want to live life with my money. I am hearing that comment regularly now from born and bred kiwis from Auckland from long time generations, Auckland has changed and they now have opened there eyes to leave and find a better balance of living. I think that's the future some here are espousing...Auckland no longer for NZers, but as a destination for those from worse places...Young NZers will have to make way. Sorry kids, but that's the price for keeping investment portfolios growing for the old folks. Does it make sense to buy a house which is (I’m guessing) something like 2 standard deviations from the historical mean P/E and price/income ratios when interest rates are the lowest in history and the long end of the yield curve is rising? Do you want a house with council rates = $7000 per year? New Zealand has more than one beautiful city. Leaving Auckland your salary might drop by 20-50K but your opportunities to own a house & de-risk your finances might actually be much better. Leaving New Zealand, your salary might increase by 100K but you’re no longer in New Zealand. Tough choices. The high price is probably propped up by the sought after Gladstone Primary and Mt Albert Grammar zoning. Non-zoned parts of Mt Albert will command a significantly lower price. Apart from that, it's in a very handy location where its only a few minutes walk to the train, 2 main bus routes, motorway and northwestern cycleway. "Could double in value in very few years". You are so method, I love the performance art. The George Street, Newmarket, terraced house sold for a good price -81% over CV. Looks to be above the homes.co.nz high value and with quite a high bodycorp fee although that ensures things stay nice and maintained. Elegant inner city living continues to draw a premium. Paddington style terrace is quite rare though and these were done well some years back. Yeah no logic to a speculator driven market. It's funny how in little NZ, property is judged by how well it sold over the CV price and not how much it previously sold for or even it's general condition is good, or whether it's likely to be in a livable condition or not? Is CV a benchmark for fair value? Is is a departure point for expected value? Can it also be used as an anchor to determine whether or not a bubble exists? For ex, at what higher price point above CV might constitute a bubble? 60, 80, 120, 200? CV's and discussion of supply/demand hold little substance when there's irrationality in the market (yes, I refer to Auckland). If we're in a bubble, current CV's might be 100% overvalued now, or 50% undervalued in 5 years time when the bubble unfolds. Trying to decide which is right right now is like trying to pin the tail on the donkey. Just spoke to friend in Sydney who has just been to an auction for a tiny two bed unit.his limit is $850 k.unit sold for $905k.makes some of these sales look like a bargain!!! Why don't you? It seems crazy not to. Suggesting ultimately that the best thing for young Kiwis to do is cede Auckland to global investors who want to have it instead of them? But what about the Kiwis who have fewer opportunities than you or I, Zach? Stuff them, ultimately, because that's what's needed for property portfolio growth? What ever happened to the 'trickle down effect'? All trickle-down policies, however, transfer wealth and advantages from all taxpayers towards an already wealthy few. This interventionism necessarily distorts the economic structure. In normal free markets, those at the top can only increase their wealth after providing more valuable goods and services, not before. Well brown stuff only flows down the hill. How do you think money is made? So someone has to leave Auckland, their family and loved ones so you can have high prices. Unless you get angry enough to drive change, yeah. Depends on what you do. For example, if you're a currency trader with an investment bank, you can do much better in Sydney compared to NZ. I even hear that construction employment is lucrative across all levels in Sydney. If you're an architectural designer, chances are you'd be no better off. Most of that work is being outsourced to Vietnam now. Crisis or No crisis - National is going out. Reality check. Like it or not. Would have thought 14 sold from 22 is really good result. NZ Herald are going abit over the top with their feel good stories about youngish people buying homes in Auckland at the moment. Article today had a young couple who,have bought a 2 bedroom unit for over 600k and were going to build on an extra bedroom and rent out. The amazing thing is that between the two of them they had saved 30k and their parents had gifted them approx 250k and borrowed the rest being 60 per cent. They were going to buy another couple of properties in the future from leveraging. Whip de Doo! They haven't yet somwhy comment? This would have to be the most unimpressive property storey I have ever read, and scraping the barrel now if this is newsworthy! I can give you many examples of people buying property on their own and would be far more successful and financial than this young couple. Their 600k property may be worth less than they paid for it the way the Auckland investment market is at the moment! Wow TM2, that's a very good analysis on the Herald article (scraping off the barrel) and I have to admit, I agree with the sensible points you have made! I like this tone of yours, let's keep this going. Not trolling here, but I wouldn't be surprised to see more Aucklanders moving to Christchurch which would have some positive effect on the under/over supply in both cities. Not applicable for most people obviously (due to work / family), but for those who are flexible to pack up and move cities I'm sure there will be a number of people doing so. I agree, we are not living in medieval villages anymore. Moving should be a fun and exciting prospect for the young person, as it is generally. Rich, not sure by what you mean by the tone of what I wrote. I tell it the way it is and anyone can take it the way they want. The story is totally unremarkable and after reading it I thought that basically the parents have given the young couple all of the 40 per cent deposit. you can see why house prices in Auckland are so high due to money being gifted from Parents from Asian countries to their kids. If this is what is happening and it looks like it could be, I can see why the young Kiwis are totally pissed off! What I would suggest is that Christchurch is a great city to live in and still affordable and opportunities are here. Not the same traffic hassles and plenty to do, although Gordon will have a different opinion!!!! I read the tone of the comment as positive. I was also thinking of criticizing TM2 for appearing to be a bit too negative about Auckland and going over to the other side. But then I actually really want to have civilized discussions believe it or not. The main issue we have here is that many commenters believe Auckland is a bubble while I maintain that there are good reasons why prices are what they are and good old Kiwi self-deprecatory thinking is blinding them to the facts.. I think RickStrauss sees the logic of my argument but is opposed to the direction it is leading us. >"I think RickStrauss sees the logic of my argument but is opposed to the direction it is leading us." Yeah, that's about it. Agree. I reckon we do have some responsibility to foster housing/home outcomes for New Zealanders - more of them than just the investor subset born at the right time - as opposed to making Auckland a Luxembourgh-priced short-term stopover for investors ultimately heading for an Alpha city. Not sure where you got that from, yesterday morning I was sitting in the sun in Christchurch in shorts and t-shirt, high teens at least. Today I was out at lunch time, again very comfortable in short sleeves. Gets a little chilly occasionally but it's easy enough to slip on another layer, I spend a lot of my time biking/running/kayaking and would happily take the cooler Chch climate over Auckland which has roughly twice as much rainfall as Chch. All depends on what you're after in life. I was on the beach in Chch yesterday enjoying the warm, clear day. Blue skies, slight breeze, no humidity - it was heavenly. Lots of people out doing the same. The boys and I even went for a dip in the sea. You'll see a lot more Aucklanders moving to Christchurch once the quakes stop and the volcanoes start. Flippancy aside, the South is generally seen as "less safe" by a lot of Auckland based immigrants, and the quakes are a good part of why. The asians are very familiar with collapsing buildings. Before Chistchurch one explained to me the old buildings were safe, the new ones were dangerous and never use the stair well in an earthquake. I have several Asian friends who experienced a number of racist abuse events in ChCh. I've also, in general, found Cantabrians to be pretty small minded. For me, the tolerance of a place is really important. Generally speaking, I'd say Auckland is very tolerant. I fear that may change, if young Kiwis start to recognise how much they're being marginalised by policy makers and investors who had the genius to be born at the right time. If they're not being listened to, will they resort to more extreme action in future as discontent foments? That would be a sad direction for Auckland. it is amazing .... recently there is quite a few articles that are describing how people recently are building their property portfolio - did you notice? Anyone - from migrant, 2 girls , c55 year old cleaner lady and today's couple. They all become successful property investors - with very little money - must be so easy !!!!! In my view - it is to mislead people, to show them that 'this is normal' , that 'everyone can take mortgage' - clearly if 55 yo lady can - 25 year old will be able to do it easily. Paid advertorials for Ron Hoy Fong's get rich quick schemes. That revolting Anne Gibson has no shame. and even her write ups are polishing a t-rd, latest one all glowing about saving 30k to buy a house, but read on turns out their parents gave them 265K, we don't know how lucky we are. And now Stuff get in to the act. Saved 4 years for first house in Whangarei. Nice story Bro, but he bought it in 2012.! Perhaps they wrote the article in 2013 but lost it for the last 4 years! the markets including housing. You would be silly buying a house anywhere now. That SYD price is not at all surprising. You can not compare SYD with AKL. The quality of life is miles apart. Thats why I can not believe what people are paying for places in AKL. AKL is a very very average place to live. The weather, housing quality, infrastructure and salaries are absolutely appalling. People are insane paying the amounts of money they are for such substandard living. My wife and I moved to SYD 8 years ago and it was the best thing we ever did. AKL is still home though and it very much bothers me that my home town and city have been ruined by greed. Sounds like you have forgotten what the Auckland air tastes like. There is some beautiful real estate in Auckland. Never lived in Auckland, though have been there a few times. Also, travelled overseas to many places worldwide. Of course I am biased, but firmly beleive that Christchurch for quality,of,life,in most respects does leave Auckland for dead. Yes you do get used to,where you live and obviously will,have a preference. The thing is that the earthquakes are now not a problem for us as if you have lived thru 15000 plus shakes and still here then you have staying power. Personally prefer a shake every now and then to having to put,up,with the major problems that Aucklandites have to put up with everyday, and it will get worse. Chch is growing and the future is looking extremely bright. I believe that the population is going to grow as may Aucklandites and overseas immigrants come in. You may be able to confirm that Christchurch had the highest consumption of Vallium in New Zealand before the earthquakes, must be causing global shortages by now. The North Westers are the problem perhaps.. Positively, not too sure why Chch people would be taking Valium before the earthquakes as most people who lived in Christchurch were high on life! Probably be some since the earthquakes however I am sure there are far more in Auckland with having to live with the stress of the Auckland lifestyle. The findings of the current survey support the observations of a number of other studies which highlight a high frequency of off-label use of AAPs across diverse patient populations.5–10,22 The results reveal high levels of off-label prescribing amongst Christchurch psychiatrists, with most prescribing generically. The reported rate of 96% is significantly higher than the 65% rate of off-label use found in a 2000 British study with similar methodology.23 Whether this is due to overall higher use in NZ, a local phenomenon or a reflection of increased use over time is not possible to determine from our data. If ChCh is so fabulous why have large Nth American re-insurers stopped underwriting ChCh ? Well it's going to be interesting to see how much the Auckland property market has 'softened by' at the end of April. Then we're in to Winter which isn't that good for sales, lets see how things fair in the next few months. I genuinely think all these Herald articles lately about people buying homes with massive parental help is all about a real estate industry push to normalise this kind of activity. They realise that pricing has nowhere to go now, the only things selling in Auckland are the big houses at 5k Westinghouse Avenue. The only way for the rest of the market to move is to do what the Asian cultures do, and pool inter-generational resources. Once you can run story after story on people who've done this, you can convince those with housing that they need to be starting bank accounts for their toddlers to gift them their first house deposit on their 23rd birthday. The RE industry isn't stupid, they know that the goose that lays the golden eggs has well and truly been laid-out. However, they know that there's a way out for them and that's to scale up the housing market by turning it into a fractional-reserve style system whereby nobody owns their own home outright, but the value is continually traded up by diluting existing equity. Makes it pretty critical that young people fight for better policy then, really. Northern Lights, thanks for the compliment of calling me A Boy! I will take that gladly. Doesn't seem to be much trouble getting insurance on Chch property nowadays! You should be buying in Chch as investment money will be leaving Auckland in the future for a stable Chch market. Is there anything left in Chch seemed that most of the population moved quite literally to safer ground? All my neighbors here in Auckland are from Chch.